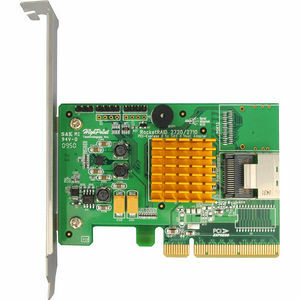 RocketRAID 272x/1x HBA's are versatile, cost effective PCIe 2.0 x8 6Gb/s SAS connectivity solutions that offer LTO Tape and RAID support for Windows 8.1/8/7 and Linux kernels 2.6.x and later. The RocketRAID 2710's single mini-SAS port can directly support up to 4 SAS/SATA HDD's/SSD's in RAID 0, 1, 5, 6, 10, 50 and JBOD configurations. RocketRAID 272x/271x series HBA's are fully compliant with the Industry Serial Attached SCSI Specification, which allows them to support LTO tape drives and SAS/SATA Hard Disk Drives, simutaneously, for Windows 8.1/8/7 and Linux PC Platforms. O.S. Support: Mac OS X 10.8.6 or greater and Windows 7 and 8. LTO Tape support requires Windows 8.1/8/7 or Linux Kernel 2.6 and later.